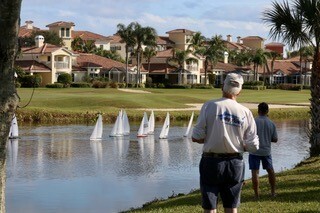 Welcome to the Grand Harbor Yacht Club at Grand Harbor in Vero Beach, Florida. The information below will hopefully help you decide if you would like to share in our r/c adventures and misadventures! We currently boast a fleet exclusively of 23 CR 914s, and sail them every Sunday (weather and dispositions allowing) with practice at 1 pm and races at 2. Usually anywhere from 8 to 13 boats show up. Two of our boats are “loaners” which are reserved for passersby who demonstrate even the slightest interest in joining us. 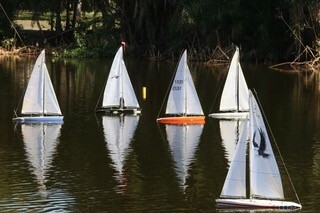 The Venue is available at all times for Captains who want to sail informally. 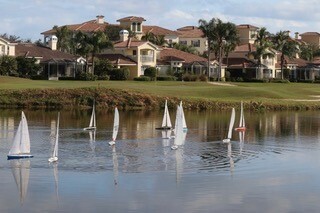 Our members are almost all residents of Grand Harbor, most but not all with sailing experience. Most of us are growing old with grace, failing eyesight, and an improving sense of humor, and most are of the male persuasion except for Captain Tina who exudes limitless energy and delight. 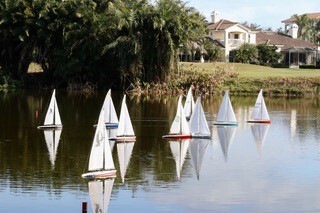 We sail at The Sunset Cove Sailing Venue which is alongside Via Marabella Boulevard in Grand Harbor. 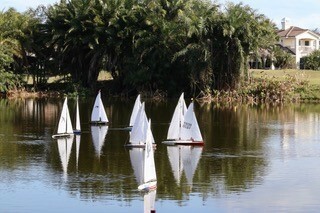 The Venue boasts a fresh water pond with marks in place all season. A movable starting mark sometimes provides for a proper upwind leg. Each week we put chairs out along the shore, as well as a Pavilion which is actually a colorful beach umbrella. Our Bistro is a cooler with an assortment of beer and other savory libations which we quaff at Halftime or at the conclusion of the races. 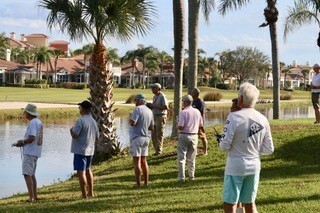 Onlookers every week include several residents of Grand Harbor and an assortment of turtles, birds, otters, and alligators. One of these days an airborne mullet promises to dismast one of our boats. Our unwritten but totally understood mission is to improve our skills as r/c sailors, with emphasis on seamanship, boat trim, respect for the rules of racing, and having fun. The GUST (Geezers Under Sail Trophy) is awarded to sailors who distinguish themselves, and The Fugawe Trophy goes to the captain whose craft spends the most time in the shoreline weeds.